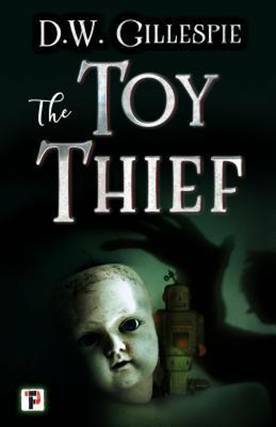 An engaging, frightening, intriguing character-driven horror tale that walks a perfect balance between creature feature and ghost story, The Toy Thief was as enjoyable as it was compelling. I only read in bed nowadays and this book had me in the sack by 7:30 p.m. for a few days and kept me up late on each occasion. In essence, the title tells you all you need to know to slide into the book: somebody/something is stealing toys. That's your premise--that's your impetus. On the surface, "big deal," right? But look beneath the covers and it's a fascinating concept. Who/what would do this? Why? And, most thought-provoking, what happened to all of YOUR missing childhood toys? Jack knows. Jack is the woman doing the narrating (yes--Jack's her name) and her story takes her from the 30-ish woman she is today back to her life as a precocious 8-year old where we follow her as she walks us through a terrifying story of a family being torn apart by an entity that does something as innocent-sounding as stealing childrens' toys. The book is a page-turner. Gillespie unveils the being responsible for the thefts in a deliciously methodical manner, giving the reader a glimpse here and a glimpse there, but never the whole picture--never. The reader fleshes out the complete toy thief from the parts provided by the author. YOU put together the puzzle, not Gillespie. That was cool. Well-done. The main characters were perfectly drawn more from dialog than from description. I liked Jack immediately; liked her brother Andy less, but understood his personality from the relation of events in the family. Their father was a sympathetic character drawn in a manner that focused on his human frailties but also gave great emphasis to his protective, paternal nature. In short, you're going to understand these characters. Minor characters are fleshed out just enough--not too much to waste the readers' time, but enough so their motives and appearances in the book are obvious. One minor portion in the dénouement troubled me just a bit. It wrapped things up nicely but seemed a little contrived, a little "would that really happen?" and that's solely because it was a throw-away paragraph that would have made an excellent sub-plot, but might have added too much to the book. I think The Toy Thief is a must-read from the horror novels introduced in 2018 and I'm looking forward to more from D.W. Gillespie.